Do you wish you could get more use out of your existing porch, but are unsure which porch enclosure is right for your space? 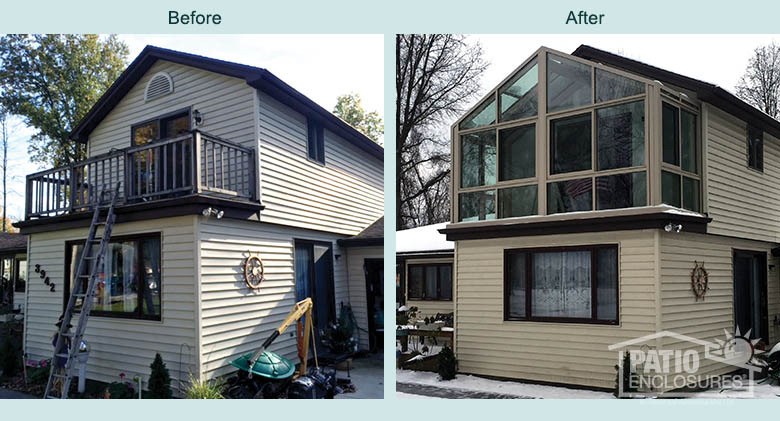 These New York homeowners worked with Patio Enclosures® to design a solarium that is a true extension of their home. 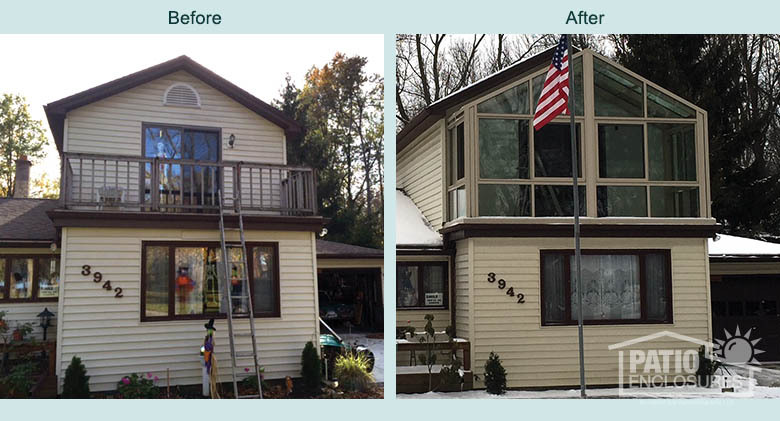 Homeowners in Grand Island, NY rarely used their second-story front porch due to insects and harsh weather. Located off the master bedroom, the couple wanted a sitting room where they could stargaze in the evenings year-round, without the noise of the busy road. The couple also wanted the solarium to match the style and design of their house. They decided to meet with a design consultant from Patio Enclosures of West Seneca, NY to discuss ideas for their new space. During the in-home consultation, photographs and measurements were taken for an accurate estimate. The couple chose a gable roof that matched the pitch of the existing house roof, with one-inch thick, dual-sealed insulated glass to keep the room comfortable in every season. A Patio Enclosures in-house engineer custom designed the homeowners’ solarium, and one of our experienced crew members expertly installed the solarium. Why Should I Choose Patio Enclosures for My Solarium Addition? Patio Enclosures brand sunrooms have been trusted by homeowners for over 50 years. We are sunroom experts because we not only custom design and manufacture each room, we also install, guarantee and service our rooms as well. Controlling the process from start to finish allows us to deliver the highest quality solution every step of the way. Because Patio Enclosures rooms are custom designed and custom made, we offer endless ways to customize your sunroom addition. Frame options. Our solarium frames are constructed from extruded aluminum which provide structural integrity and durability. Roof options. Whether you prefer a sloped or gabled roof, or wish to use your existing roof, Patio Enclosures can match the style of your home with our roof options. Glass options. Our double-pane insulated glass comes standard with our solariums. Double-pane glass improves heating and cooling performance better than single-pane glass and blocks UV rays 44% more effectively than ordinary glass. If your looking for top-of-the-line, energy-efficient windows, we also offer the Comfort-Gard® Plus High-Performance Glass with 1-inch-thick soft-coat Low-E and argon gas, which is the most advanced glass available to maximize heating and cooling return. Hardware: Our hardware options include color-matched Euro-style handles and large, easy-to-grip screen handles. Color Options: Patio Enclosures offers white, sandstone and bronze color options for our solariums. Our powder-coated finishes provide the highest resistance to chipping, fading and peeling, promising great color for the life of your sunroom addition. If you’re interested in learning more about building a solarium addition for your home, schedule a free, in-home estimate, or give us a call at 1-800-230-8301. 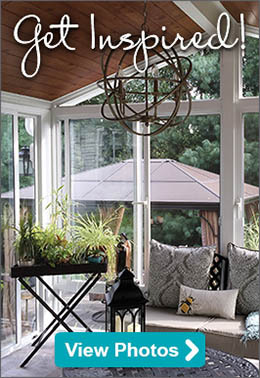 What are the Benefits of Adding a Sunroom?